Irma Stern’s search for the Africa of her dreams, which had fuelled her imagination as a young woman in war torn Germany, was somewhat frustrated by Cape Town and its colonial English society of the period. Soon after her arrival in the early 1920s she began a quest for ‘her’ Africa. This led her to the east of the country: Pondoland, Zululand and Swaziland. In lonely rural areas she found her ideal material; indigenous people, and thereafter she wasted no time in depicting them. She worked tirelessly in situ and brought back to her Cape Town studio finished drawings, gouaches and sketches which in many cases were the basis for her oil paintings. By the mid-1930s, these expeditions had become a well-established custom of Stern’s.‘Portrait of a Woman’ (1935) is a superb example of Irma Stern’s graphic ouevre, mid-way through Irma her prodigious career. This era of her output was defined by depictions of South African, and sub-Saharan, people, landscapes and still-lifes, as the rise of Hitler prevented Stern, a German Jew, from returning to Europe. Instead Stern immersed herself in the cultural heritage of Africa, undertaking numerous expeditions across South Africa, Zanzibar and the Congo, amongst various other countries. 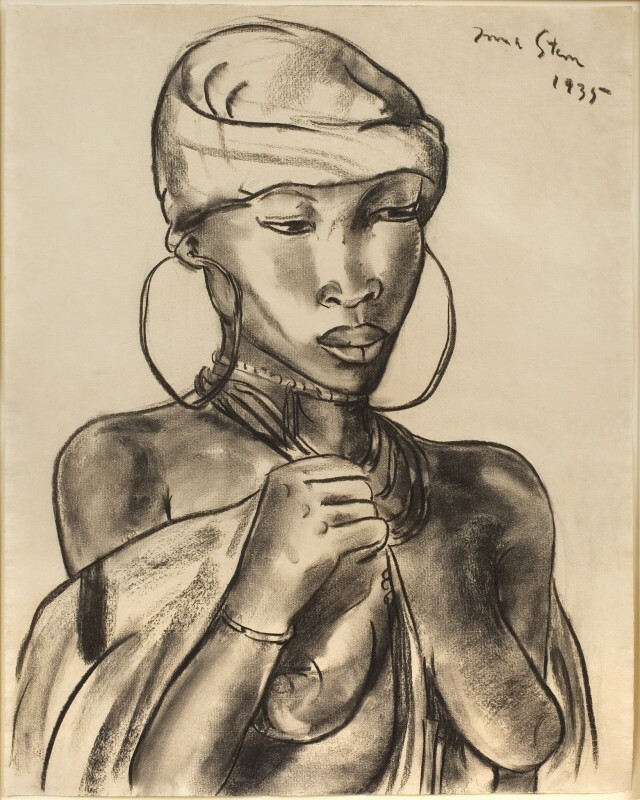 A boldly realised charcoal of a South African woman in traditional dress, this work demonstrates both Stern’s artistic training grounded in the traditions of Western portraiture and influenced by the modernist developments of Expressionism in Germany, and her sympathetic and evocative portrayal of her South African homeland. Demonstrating mastery of line and shadow, this young Xhosa woman is a classic, with her great hoop earrings framing her face and her gaze averted: Stern celebrates her natural grace. The drawing is very closely related to several similar drawings in the collection of the Irma Stern Museum in Cape Town from 1935, all titled Head of a Woman, and depicted in a similarly portrait bust manner, signed almost identically and of exactly correlating dimensions, suggesting works from the same sketch book, a project dedicated to heroic depictions of indigenous women. These sketches, particularly confident and sculptural in style compared to her more painterly later work, show the influence of German Expressionism, particularly here the emotive graphic work of Kathe Kollwitz is evident. Filling the page, the woman of Stern’s portrait is monumental, severe, heroic, recalling, despite her tribal garb, classical busts of goddesses. Her bare breasts, rather than a symbol of sexual availability, suggest instead woman as life-giver and life-provider, and the tradition of the closeness between the fecundity of the female body and that of the natural world, a particularly apt allegory for African tribes so intimately linked to and dependent upon their environment. Stern skillfully depicts the woman’s luminous skin through charcoal shading, highlighting touches of light upon her shoulders and cheekbones and dark shadows under her breasts. Her naked torso is emphasised by her oversized hoop earrings, her multi-layered necklace, her headdress and the covering she pulls up to her neck.